The Entry Level Graphic Design Resume Template delivers a manageable way for a job hunter to develop a professional resume. 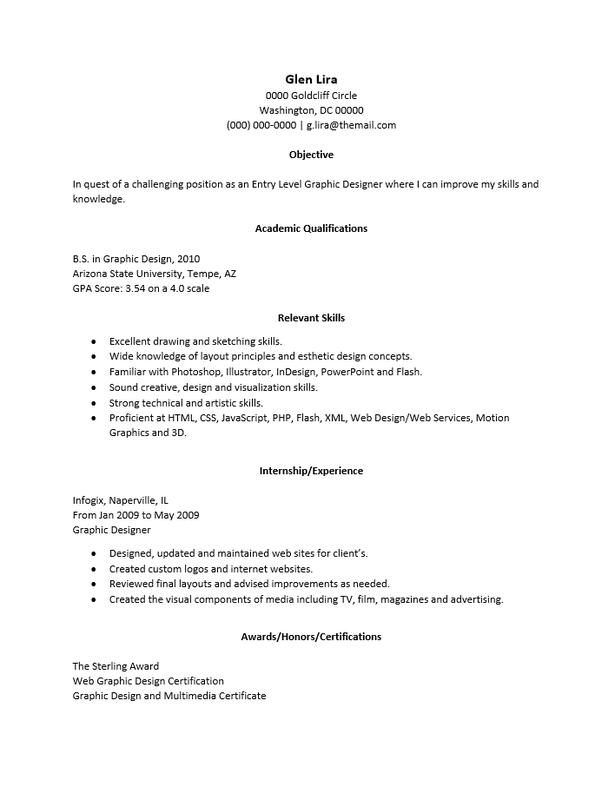 An entry level graphic designer will want a resume that will deliver information regarding his or her ability to function as part of a team, communicate with clients and fellow team members, and the logistic skills necessary to bring their project’s success to fruition. In order to convey such information, a resume should look professional and be smartly composed. Utilizing a resume template with a pre-set headings and formatting will relieve a job seeker from some of the more tedious questions regarding these subjects. Thus, a graphic designer may focus more on content by simply plugging in their content in the appropriate area. When composing the content for a resume, one should remember to be straightforward and to the point. It is wise to employ technical jargon as much as possible, especially in the Objective and Relevant Skills section. It is also important to bear in mind that few would expect and entry level graphic designer is not truly expected to have an extensive employment history in the field so it would be unnecessary or even unappreciated to fill this section with non-relevant experience. A potential employer is primarily interested in things that are directly applicable to the job at hand. This means that so long as the resume’s content stays focused on the topic at hand, it will come off as sleek and professionally written. Such a document may significantly increase a hiring entity’s interest in the candidate. Step 2. Write one to three brief statements explaining the purpose of the resume and, if desired, how your skill or experience will benefit the employer. Put this in the “Objective” Section. Step 3. In the “Academic Qualifications” section, report the title of the degree you earned, the year it was awarded, the name of the school and location where you earned it. Also include any relevant or impressive information following this basic information. Step 4. Make a list of your skillset and proficiencies. Place this in the “Relevant Skills” section. Make a serious attempt to address any required listed in the job posting. Step 5. If you only have an internship then place this information in the “Internship/Experience” section. For those who have professional experience and no internships, title this section “Experience.” The idea will be to give a potential employer information regarding any employment history. This should be a list of places where you worked in reverse chronological order. Make sure to include the name and location of the employer, the dates you worked for them, your official job title, and a list of your duties or responsibilities there. Step 6. If you have earned any notoriety such as an award, report this information in the “Awards/Honors/Certifications” section.